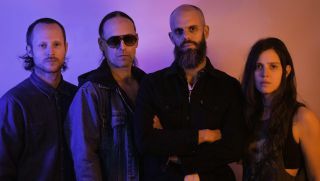 Baroness have shared the official video for “Seasons,” from their upcoming fifth album, Gold & Grey. You can check out the clip below. “Seasons,” which the band premiered at a recent Worcester performance, takes fans behind-the-scenes into the recording for Gold & Grey, featuring pre-production footage from singer/guitarist John Baizley’s Philadelphia basement studio. Gold & Grey is due June 14 via Abraxan Hymns. The bulk of the album was recorded at producer Dave Fridmann’s (The Flaming Lips, Mogwai) upstate New York Tarbox Road Studio. Baroness have also announced a five-week U.S. “Gold & Grey Tour,” kicking off on July 11. Tickets are on-sale this Friday, April 12, at 10 am local time. Gold & Grey is available for pre-order here. See below for all tour dates.